To add a new service, please do the following. 1. Click the Add button under Retail or Wholesale. 2. In the new window fill out the Date of Birth, the Last name and the First name of the patient. 3. Select the Status of the service, and the Referring Doctor. 5. Click the plus button to add a new study and select its type. 6. After adding the study start typing an ICD code to add a Diagnosis. 7. 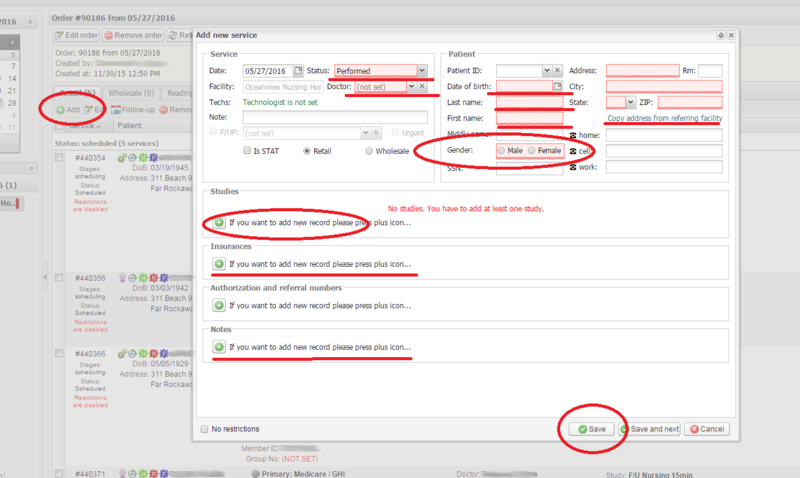 If the study is related to a technologist’s visit entered via the Schedule module, select the visit in the Event drop-down list. 8. Fill out the required fields such as Status, Doctor, Facility address and Insurances. 9. Fill out Notes if you have something to note. 10. Save the service after you have filled out the fields. 11. Upload the required documents.